Cape Verde is a tropical archipelago located 500 kilometres west of Africa, at the level of Senegal and the same latitude as the Caribbean. The islands enjoy ideal climate conditions year round for the practice of surfing sports, in particular during the trade winds season in winter. On the island of Sal, the Surf, Kite & Windsurf Centre is located on a three kilometres white sandy beach and rock-free waters in the heart of Santa Maria, at the southern tip of the island. This three star hotel opened 2007 is situated in the heart of Santa Maria, close to the golden sandy beach. It is a special place born from the perfect fusion between arquitectural elements, light and nature, all in harmony with the Feng-Shui philosofy. The Restaurant & Bar is an open space perfect for a local and meeting point where to taste those special Cape Verde dishes. The hotel is located at 11 miles from the airport, If you take a taxi from the airport to our hotel (the price is about 10/15 euro). The hotel is 300mt far from the beach and 5 minutes walk from the centre. Accomodation rates/night it depends if you want to come in low or high season, if you want double or single room and bed and breakfast only or half board. Daily cleaning except Sundays. Linen supplied (towels and sheet) changed 2 times a week. We organize also the transfert from/to the Airport. The Surf, Kite & Windsurf Centre is located on a three kilometres white sandy beach and rock-free waters in the heart of Santa Maria, Cabo Verde’s surfing heaven. With an off-shore wind at the beginning of the bay and a slight on-shore wind at the end of the bay it is a perfect location for both beginners and experts. This spot is great for making long runs in clear blue water. If it is wave riding you seek, the centre organizes safaris to the other locations on the island, such as Kite beach and Ponta Preta. The latter is where you can find radical World Class waves, sailable with side offshore winds (experts only!). The school offers courses and rentals in all three areas of Surf: Wind, Kite and Surf. Instructor’s skills range from the ability to teach those who seek to learn the sport and enhance the skill level of those who want to shift to the next level. The School is well established in its environment and therefore its instructors are well versed in the day to day conditions for all types of surf. With a focus on safety and supportive learning, the school teaches all its students, irrespective of their level, how to surf safely in their chosen surf sport. All instructors are multi-lingual and qualified to teach all levels of the sports, weather it is starting new, or expanding the boundaries of existing skills. 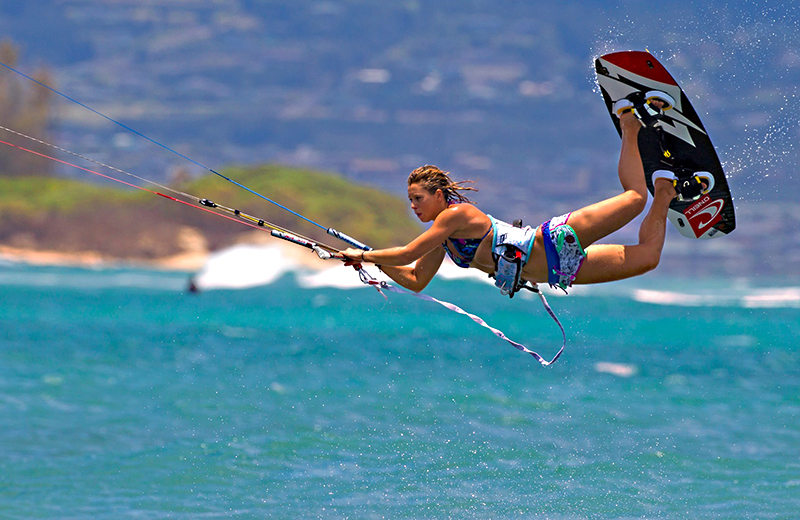 The Wind, Kite and Surf courses are developed so as to teach a variety of age and skill levels. All theory is hands on and occurs on the beach with the equipment. Our goal is to move you to a stage of independence where you can then practice the skills we have taught you. For those with friends and family not partaking in any form of surfing, we are located on a beach club, with mattresses, umbrellas, fresh showers as well as a bar and restaurant. The ideal spot for Surf, Kite & Wind Surf, both beginners as well as advanced surfers is in the bay of Santa Maria, right in front of the surf centre. Defined by its clear glassy waters and white sandy beaches, complimented by a slight off-shore wind at the beginning of the bay and a slight on shore wind at the end, it is a surfing haven. Other locations include the world famous Ponta Preta as well as the less risky Reef and Calheta Funda, known for off-shore strong winds with good waves, advanced wave riders love it ! On the east coast there is Cabeza de Salinas, popular for its on-shore wind, nice waves and safe beach. It is perfect for intermediate to advanced kite surfers and expert wind surfers. All locations areas are within a 5 to15 minute drive from the station. Kite Surf : From December to May: The trade winds blow and the wind is at its strongest on the island. Avg is between 18 and 26knots From June to November: The wind is a little lighter. It tends to be between 10 and 16knots. Water: Water temperature is warmest between May and October (like a warm bath tub). During the rest of the year a shortie wet suite is recommended. Cabo Verde (Cape Verde) In the middle of the Atlantic Ocean south of the Canary Islands (Spain), the Cape Verde archipelago lie 600 kilometres west of the African coast, at the level of Senegal and at the same latitude as the Caribbean. This once unhabited islands we red discovered and colonized by the Portuguese in the 15ht century. They made it a trade centre for African slaves on their way to America and later on, an important supply stop for transatlantic shipping. The islands achieved their independency in 1975. The archipelago is formed by ten main islands, nine of them inhabited. The islands are divided into windward (Barlovento) and leeward (Sotavento) islands. The largest and most populated island is Santiago, which also hosts the capital Praia. Although all the islands are of volcanic origin, they differ widely from one another, ranging from the flat, desert like Sal island to mountainous and the still active volcanic Fogo island, culminating at over 2.800 metres (9,200 ft). Most of the population is Creole of mixed Portuguese and African descent, with some remainder of blacks and whites. This combination of African and Portuguese culture is reflected in the music of the islands, a rich tradition which has conquered the world with Cesare Evora and her famous “morna” ballades. A windward island exposed to the trade winds, Sal lies in the northeast corner of the archipelago. Practically unhabited until the 19th century, this low lying, desert island takes its name from the salt fields that brought some wealth to this rather desolated piece of land in the middle of the Atlantic. Today, the island thrive on tourism, thanks to its unpolluted beaches, crystal clear waters and excellent swell and wind conditions that bring ideal for the practice of watersports such as the various modalities of surfing and diving. The island also boasts the only international airport of the archipelago, developed before WW II as a refueling stopover between Africa and America. There are three towns on Sal island; Espargos, the administrative centre and airport, Palmeira, the harbour, and Santa Maria, the tourist resort on the southernmost tip of the island. The islands enjoy a dry, tropical climate with two defined seasons: From November till July, (Dry season), the weather is tempered by the cooling trade winds blowing from the Northeast. From August till November (Wet season), the weather is cooler and more humid, although precipitation are scarce, in particular on flatter islands. Mean day temperatures through the year range between 20º to 25º and rarely reach the 30º. Sole international airport of Cabo Verde archipelago, 18 km. from Santa Maria on Sal Island. 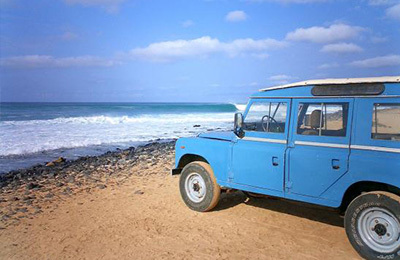 TACV (Cabo Verde Airlines) operate flights to Ilha do Sal (Island of Sal) from several European cities including Paris, Amsterdam, Lisbon, Madrid, Milan and Munich direct to Cape Verde with connecting fares from most UK airports. TACV also operate a regular service from Boston, Dakar, Fortaleza and Las Palmas de Gran Canarias. TAP (Air Portugal) operate daily flights from London via Lisbon to Cape Verde.